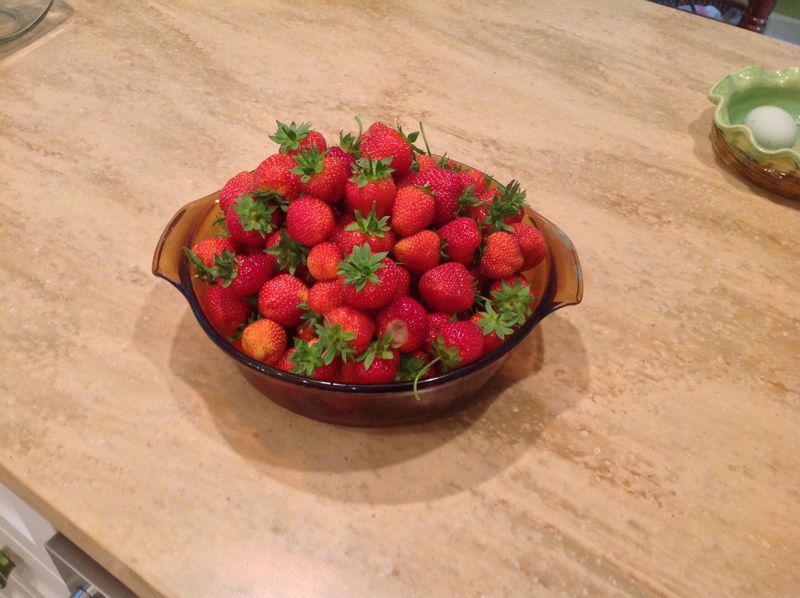 My strawberries are coming in! Here’s the first day’s pick–Friday. Something over two quarts. The bowl is large. These berries are, if I remember right, called “Sparkle” and are renowned for their taste. The second day was even bigger. I took a bigger bowl out to the garden. Got around three quarts. 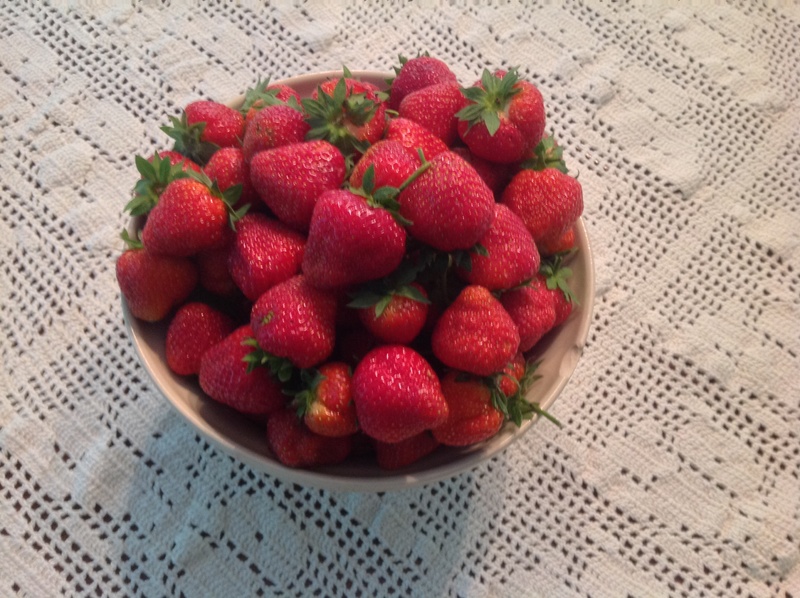 Today, Sunday, a smaller pick, but the berries are still large, and the bushes are loaded with developing strawberries that are still green. 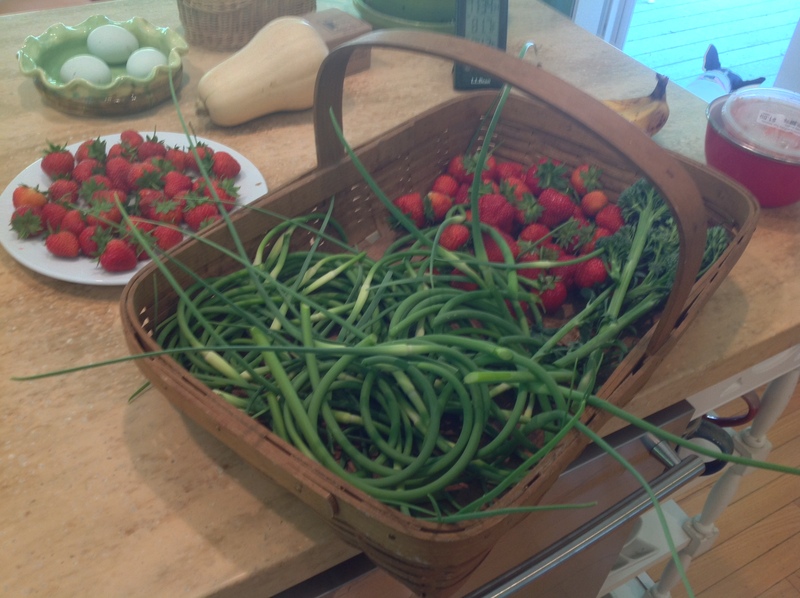 I also cut the garlic scapes (delicious!) and will make a soup with them. I made a chicken bone broth over the past two days. And, I picked the heads off of each of the broccoli plants–now they will bush out and grow more heads. Or so I hope. Our first CSA pickup out at Hope’s Edge was last Friday. We got the loveliest sack full of lettuce, greens, herbs, green onions AND three pounds of wintered-over potatoes–a tasty treat. Get out the duck fat for frying some up! It’s swimming HOT today. But not so humid. It’s the first solid summer heat we’ve had. JB, Stumbled on this link ( somewhat purposely) and am captivated…..Tara’s life seems like an extraordinary adventure into fascinating friends, places, purpose, dedication, chance, circumstance, and all things that make a life exciting and challenging. You must be a proud Mama…..Have a pretty good sense of where she got her mojo! Regards……. Tara’s life is extraordinary. Wish she was my daughter, but she is not. I’ve known her since she was about 10 years old though. I’m having such fun watching all she is doing with the food-to-table movement.